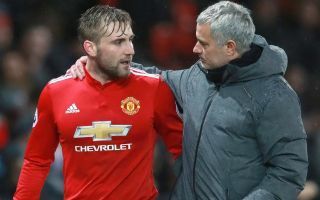 Man Utd boss Jose Mourinho has been particularly critical of Luke Shaw in the past, but it appears as though the left-back is winning him over. The 23-year-old has featured in all three Premier League games so far this season, albeit he’s gone from the high of scoring in the win over Leicester City to being part of the back-to-back defeats to Brighton and Tottenham. As per BBC Sport, the England international hasn’t always had the greatest of relationships with Mourinho, with the Portuguese tactician previously criticising him publicly over his commitment and training. In turn, Shaw will undoubtedly be delighted with what his boss had to say to him after the Tottenham defeat in disappointing circumstances, as he is pleased with how he’s performing on an individual basis right now. “I was particularly pleased, I was telling him, ‘You cannot play better than you did’. So of course the kid has to be upset with the result,” said Mourinho, as per The Mirror. Shaw will now be desperate to kick on and make the left-back position his own by adding consistency to his game while steering clear of injuries. If he can do that, then he has certainly emerged as a major positive for Man Utd amongst the disappointing results, as they’ll look to get back on track when they face Burnley on Sunday. Ashley Young has often found himself deputising in that role due to the lack of confidence from Mourinho in Shaw, but having a natural left-back in place will undoubtedly be the ideal long-term solution for the United boss.